Our plumbers & heating engineers can attend your home or commercial property to maintain, repair and install brand new radiators. Most homes are now heated through radiators, and it is essential that we maintain and repair them. We install & repair many radiators per year throughout Liverpool & Merseyside. We can accurately measure and create a customised plan on connecting them to your current central heating system. If your radiators are not heating up, have cold spots or are leaking, we will attend to diagnose the problem and provide advice on a suitable solution. All appliances in your home will require maintenance at one time or another, and your radiators are no different. Repairing and maintaining your radiators will ensure more efficient heating (and help in reducing your bills). Our engineers can also offer advice and recommendations regarding the most suitable way to configure your radiator installation with additional accessories such as new radiator valves and TRVs, which can help you to optimise your heating systems performance and potentially save you money in the long term. 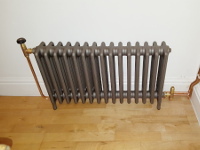 We can provide a free quotation for installing a new radiator in your home or commercial property. This may be installing a radiator in a room which currently doesn't have one or upgrading a current radiator to a larger size. You are welcome to source your own radiators. However, the majority of our customers opt for us to source and deliver the radiators creating a minimal fuss for yourself. We can source radiators of all shapes and sizes! If your radiator has come off the wall, has been leaking or is no longer heating up - we can solve these problems professionally for you too.